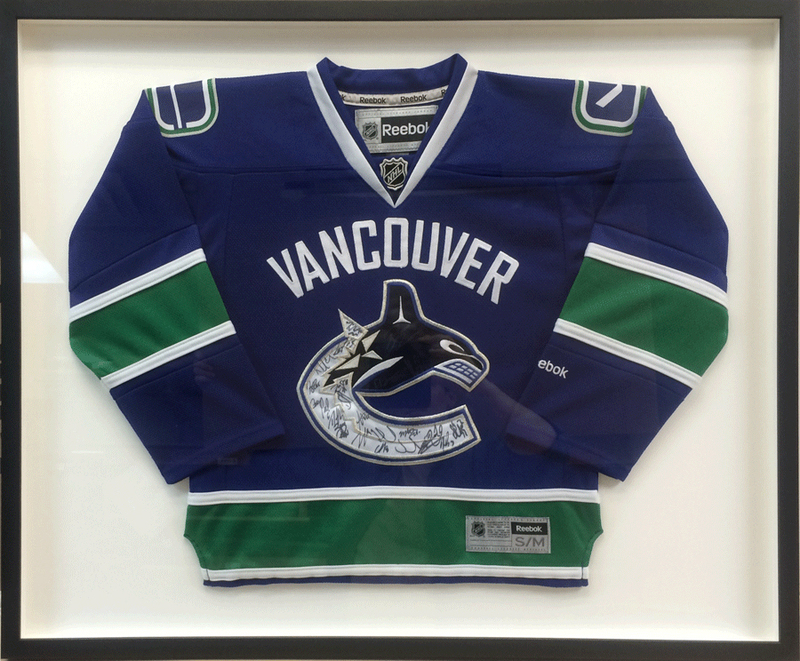 Gallery 88 Custom Framing and Art has framed numerous hockey, football and basketball jerseys. Typically we try to choose a neutral mat, often white, black or a non bright color that is in the jersey. We are always careful to choose a color that will not allow any part of the jersey to blend too much – disappearing into the mat. For as much as possible, and there always exceptions, we try to maintain a fairly strong contrast between the mat and the jersey. But the stronger color should always be the jersey. We never want draw too much attention to the framing. The jersey is what we want to showcase, not the framing. The framing should keep up to the jersey but never overpower it with competing color. fold the jersey in a relaxed, natural pattern that maintains its logical shape as a jersey. Usually there is a signature of the player and we try to showcase that, for as much as possible because it adds to the value and personal character of the jersey. player. Sometimes we are forced to show half of the number on the sleeve on one side and the other half of the number on the other sleeve. then, does not make contact with the jersey and so it to appear more natural – not crushed down by it. Usually we allow for a two inch space of mat around the jersey. That mat size provides perfect separation from the jersey and never looks too spacious. 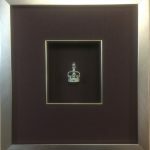 We usually use a simple black wood frame that is deep enough to allow for the relief of the material and strong enough to hold the weight of all the parts of the presentation. We like to minimize the weight of the framed jersey by using plexiglass, which is about half the weight of regular glass. This choice allows for a very stable and secure balance between weight and size. Our customers are always impressed and excited when they are reunited with their prized sports jerseys. More information about custom framing. Go to Vancouver Canucks website.